A robot security system. 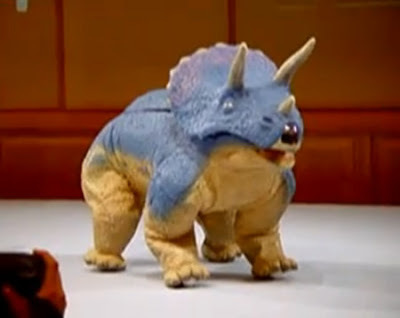 A robot security that is a $19000 triceratops that patrols your house taking pictures of would-be burglars. "In 2002, TMSUK developed the Banryu ("Guard Dragon") line of mobile home security robots. The Banryu bots were designed to patrol homes and photograph and would-be intruders using a camera installed in their snouts, but their plodding pace (3 meters a minute) made them questionably useful. TMSUK later created a zippier, 15-meter-per-minute Banryu model (that could also detect carbon monoxide leaks), but sadly the whole "cybernetic dinosaur home security" trend never really took off." How this would actually be useful, I have no idea. Its so slow that I'm pretty sure a potential burglar would either run around it, kick it or throw something over it. Check out this video to see just how slow the poor thing really is!